Poker is yet another demonstration of Christophe Claret's daring know-how. The watchmaker plays another card in a strong hand of interactive Haute Horlogerie creations. We have already had the 21 Blackjack and Baccara, now comes Poker, the latest addition to Christophe Claret's trilogy of gaming watches. Christophe Claret's fertile imagination has managed to devise the mechanism for this sophisticated card game and enclose it within a case just 45mm in diameter. For up to three players and the house, there are an incredible number of gameplay possibilities. While he revels in taking on the most improbable challenges, Christophe Claret also likes to combine grace with utility. 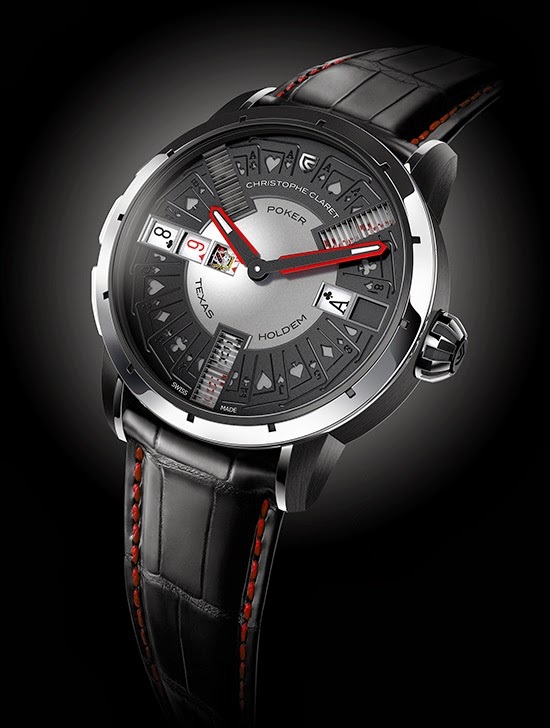 Poker was actually to be the first of the gaming timepieces launched by Manufacture Claret. While the game seems simple to organize on a table, its watchmaking version is an extreme test and no technical solution had been found until Mr Christophe Claret himself came up with the answer. While the first prototype was working in 2011, it required two years to perfect the intricate complication. Devising the gearing and bringing it all together in a mechanical movement – in other words, orchestrating a complete 52-card game following the rules of poker – is a real feat, one which offers Haute Horlogerie exciting new technical prospects. In total, Poker packs in 32,768 different combinations, i.e. 98,304 combinations for three players. The probabilities have been calculated so that everyone has approximately the same chances of winning. Users can immerse themselves in real three-player games of the most popular variant of poker: Texas Hold’em. As a recap of the rules, a game of Texas Hold’em starts with two closed cards being dealt to each player, i.e. visible only to the player. Five other open cards are dealt out in stages: three, known as the flop, after the first betting round; an additional card, the turn, after another betting round; and finally a last, the river. To have the best hand in Texas Hold’em poker, the player must have the best possible combination of five cards from the seven in their hand. This is how the PCK05 movement came into being. This completely original automatic-winding in-house caliber comprises no fewer than 655 components, and features two mainspring barrels that provide approximately 72 hours of power. There are bound to be some late nights! But no need to worry, as well as its gaming functions, Poker has not abandoned its time display role, with two central hands providing excellent legibility. Poker is the very first timepiece that manages to replicate the game in an automaton watch. The ease of use when playing Poker is as impressive and unexpected as its intrinsic complexity. Up to three players face each other around the watch. The first hand is dealt by means of a pusher at 9 o'clock. This winds up a spring, which simultaneously spins four concentric discs − one of which made from sapphire − on which the cards are printed. There is no way of speculating as to the position of the discs. After a few moments the discs are immobilized at random by dampers. All the discs are mounted on ceramic or ruby bearings so they turn as freely as possible. Once the push-piece at 9 o'clock has been pressed, the now shuffled cards are dealt in windows at 6 o'clock, 10:30 and 2:30. An ingenious mechanism of angled shutters makes them invisible to the other players. After this first betting round, the pusher at 10 o'clock reveals the flop, i.e. three cards which appear on the left of the dial. Another push-piece at 8 o'clock then reveals the turn, one card on the right of the dial. Finally, the same push-piece deals out the river, also on the right of the dial. True to his mastery of chiming watches, Christophe Claret equipped Poker with a cathedral gong, which sounds whenever the flop and turn/riverpushers are pressed. Now comes the showdown. The dial of Poker is entirely made and assembled within Manufacture Claret and was designed to offer excellent legibility of both the time and the Poker game. With subtle decoration, a matte black ring, open-worked with playing cards, is overlaid on a silvered background. Emblematic of the brand, the ruby and titanium hands – among the most expensive to make because of the complexity of machining these precious materials – are enhanced by a luminescent coating. The hour indexes are on the bezel so as not to crowd the stage. Although the dial has an incredible 77 components, its balanced harmonious design ensures that the players are not distracted. And, in a final detail that aficionados may appreciate, a breath of air forming condensation on the watch sapphire reveals a pin-up girl… Welcome to the world of the casino! This world of the casino even continues through to the back of the watch. 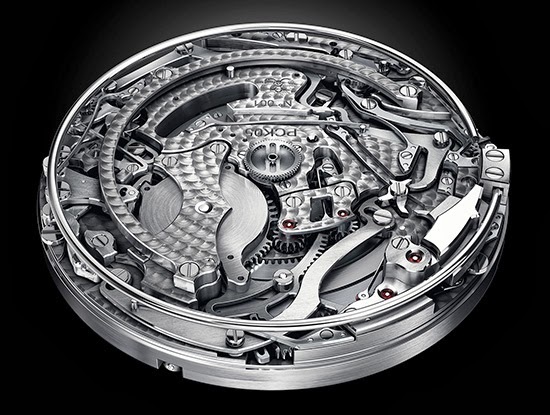 The transparent case-back provides a view of the oscillating winding rotor in the form of a roulette wheel. This rotor design is already an icon of the Christophe Claret Interactive Gaming Complication collection. Once activated by one or two shaking motions, the oscillating weight turns for a few moments before stopping: no more bets please! An arrow points to one of the 37 numbers on an inner ring. Did your number come up by chance? If so, it may have been thanks to a special key opposite a green emerald set on the case-back. This personalization is much appreciated by those who believe in their lucky number. Poker is available in four versions: two-tone, black PVD-treated grade 5 titanium and white gold; two-tone, black PVD-treated grade 5 titanium and red gold; monochrome, black PVD-treated grade 5 titanium, with blue spinel hands; and monochrome, black PVD-treated grade 5 titanium with red ruby hands. Poker is covered by a worldwide patent. Each case material is limited to just 20 pieces. Poker is an exceptional timepiece, which, like winning a big game, is only for the lucky few.